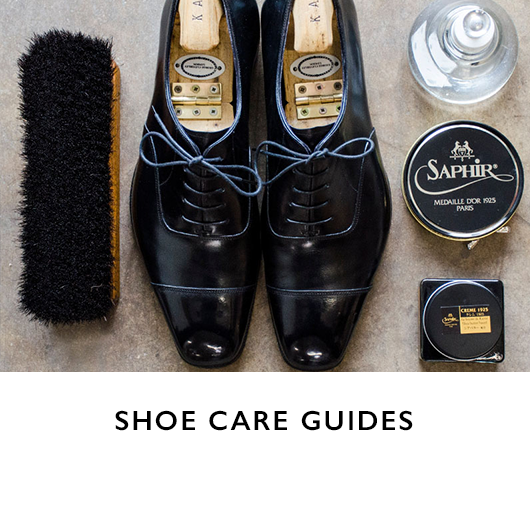 This guide gives a brief overview of the most popular Saphir Medaille d'Or shoe care products organized by leather type. Saphir Medaille d'Or is widely considered by shoe aficionados to be the best collection of shoecare products in the world. It is recommended and used by some of the most prestigious luxury brands, including: Louis Vuitton, Burberry, John Lobb, Hermes, Berlutti, etc. 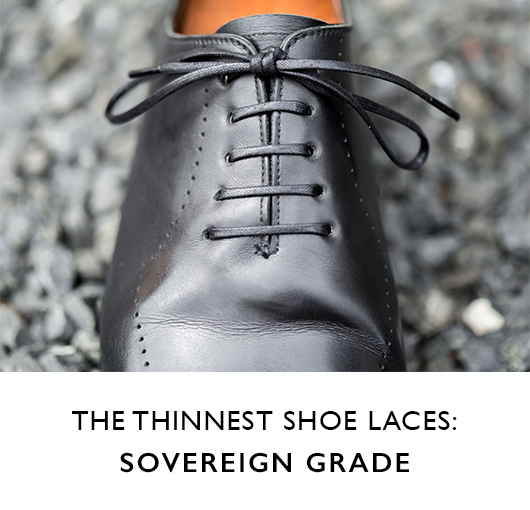 An exclusive premium line by French-manufacturer AVEL, Medaille d'Or is appropriate for those looking to take the best possible care of fine shoes and leather accessories. The line traces its origins back to the 1925 Paris International Fair, where the line won a gold metal. Its hallmark is an absolute commitment to using only the highest-quality ingredients available in the concentrated, time-honored formulations in its products. Most importantly, the Saphir cream polishes and Saphir wax polishes do not contain any of the harmful silicone or petrol products commonly found in ordinary shoe polishes. 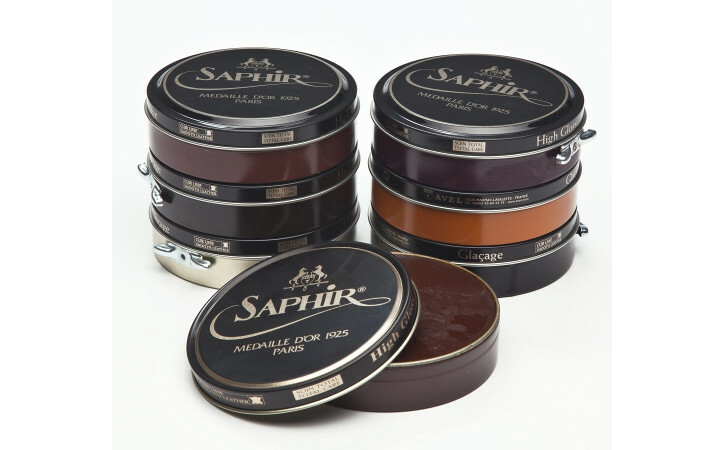 Complimenting this collection of shoe polish is Saphir's Beaute du Cuir line, which is more extensive and contains many complimentary products not offered in the Medaille d'Or collection. However these products are not inferior to the Medaille d'Or collection; but because of their more technical formulations, they do not qualify to wear the Medaille d'Or label. Saphir Renovateur Medaille d'Or is easily Saphir's best-selling product and the one most unique to the company. Based on a proprietary formulation of beeswax and mink oil, it is like liquid gold for fine leathers and is incredibly effective at providing deep nourishment to protect and restore leathers. We recommend using it as the base of any polish or to provide a soft patina between more robust shines. Remove dust and dirt from shoes. Apply a small amount of polish with a cotton chamois or dauber (less is more). Massage the polish into the leather using circular motions. Allow to dry and then buff using a horsehair brush. If the leather is particularly dirty, first clean using Saphir Cleaning Soap. If using Saphir polishes for the first time, use Saphir Reno'Mat to remove any deposits of silicone, resin, or accumulated wax. If the leather is scratched, faded, or scuffed, use Saphir Pommadier Cream Polish afterwards to re-establish color saturation and provide a soft shine. For a high-gloss shine, use Saphir Pate de Luxe Medaille d'Or wax polish. 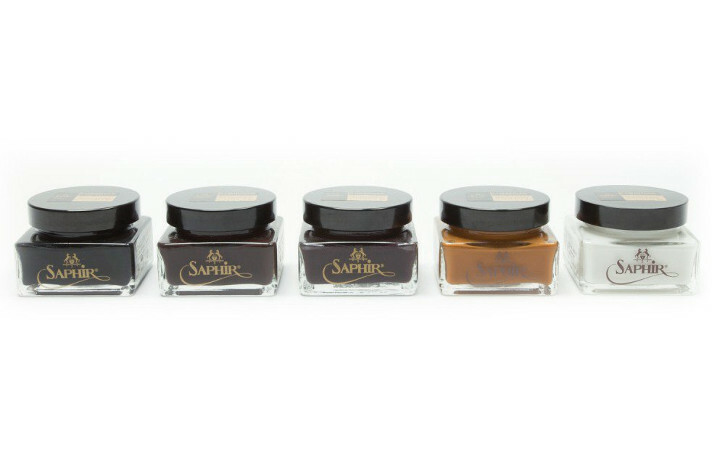 Saphir Pommadier Cream Polish Medaille d'Or is uniquely formulated to produce a soft matte patina (vs. a wax polish's high-gloss patina) while providing deep nourishment and recoloring. 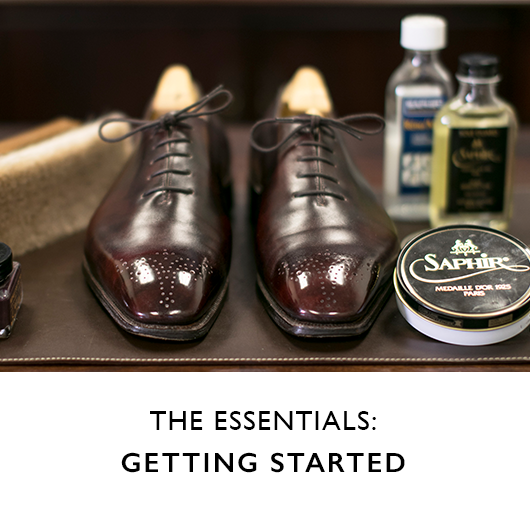 Because Saphir's Medaille d'Or Cream Polish contains a high concentration of pigments and nutrients, we recommend using cream polishes every time you polish your shoes. Then, if you want to make more of a statement with your shoes, you can use the wax polish on the toe box where a gloss finish shows up best. This cream polish is especially effective at recoloring faded, scratched, or scuffed leather while providing deep nourishment of the leather to maintain overall leather health and prevent cracking. 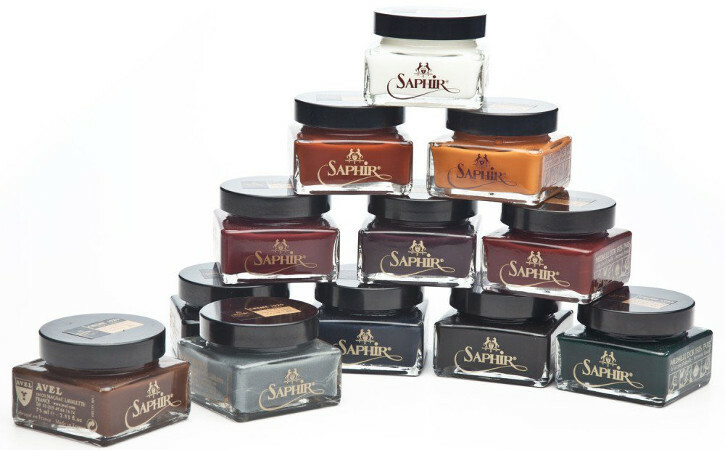 The unique formulation of Saphir Medaille d'Or Cream Polish allows the use of a greater variety of waxes (more than seven), shea butter, all-natural pine-based turpentine, and high-quality pigments to make this cream polish the best and most effective you will ever use. It is guaranteed to produce an incomparable patina while protecting and maintaining the overall health of the leather. If your shoes are particularly dirty or full of wax, silicone, or resin deposits, it is important to first clean and unclog the leather pores with the help of Saphir Reno'Mat. This is especially important before using Saphir Medaille d'Or for the first time, as silicone and resin deposits from ordinary polishes seal the leather pores and will prevent Saphir from penetrating the surface. Otherwise, first clean with Saphir Cleaning Soap. 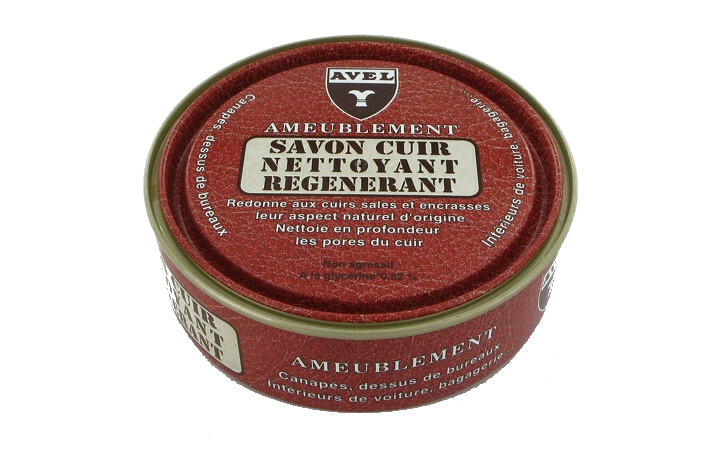 Use Saphir Renovateur Medaille d'Or as a base coat to fully nourish and moisturize the leather. Use Saphir Cream Polish when re-pigmenting is needed to repair fading, scratched, or scuffed leather. Colors can be mixed to produce special patinas. Follow-up with Saphir Pate de Luxe wax polish on the toe box for a high-gloss shine. Saphir Pate de Luxe Wax Polish provides a high-gloss shine most often associated with a mirror finish. The wax polish contains a higher concentration of waxes than cream polish. It is formulated with beeswax (8.6%), which nourishes and softens the leather, vegetable waxes, which provide a long-lasting shine, and mineral waxes, which provide water resistance. The waxes are dissolved in an all-natural pine-based turpentine which penetrates deep into the leather to deliver these waxes and other nutrients. This wax is of such high quality that it even smells nice! Apply a small amount of paste with a cotton chamois or dauber. Massage the wax polish into the leather. If your shoes are particularly dirty or full of wax, silicone, or resin deposits, it is important to first clean and unclog the leather pores with the help of Saphir Reno'Mat. This is especially important before using Saphir Medaille d'Or for the first time, as silicone and resin deposits from ordinary polishes seal the leather pores. Otherwise, first clean with Saphir Cleaning Soap 200 ml and Saphir Renovateur Medaille d'Or. 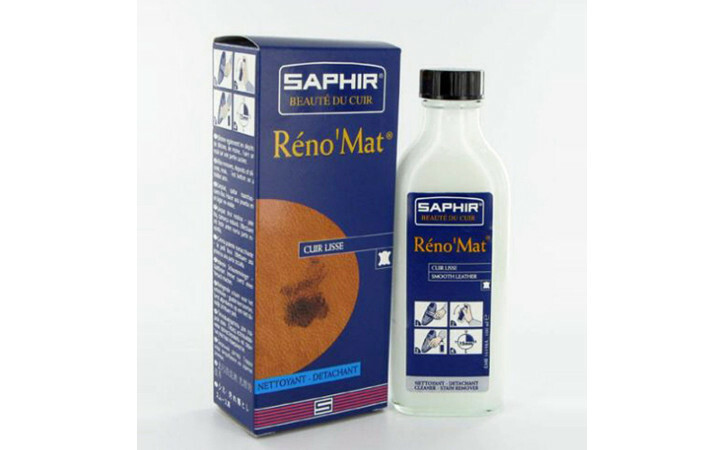 Saphir Reno'Mat is a powerful cleaner for stain-removing and in-depth cleaning of the pores of smooth leather, and removing resin, silicone, and dirt deposits that otherwise would clog or seal leather and lead to cracking. 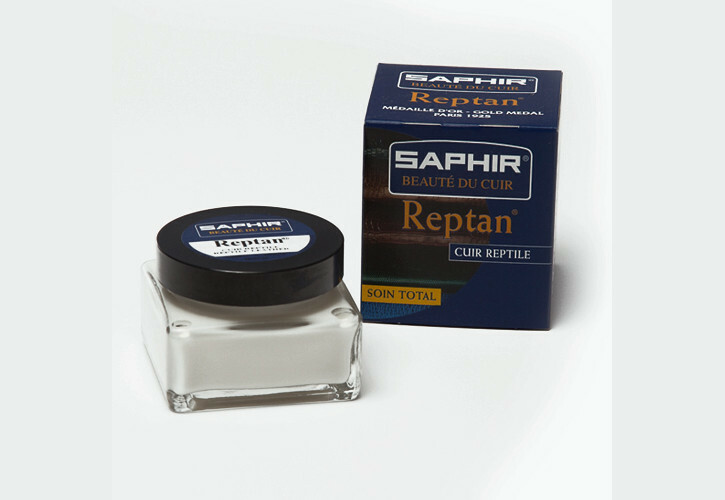 We especially recommend using Saphir Reno'Mat before transitioning to an all-Saphir routine in order to remove any build-up of silicone, resin, or waxes left by ordinary polishes. 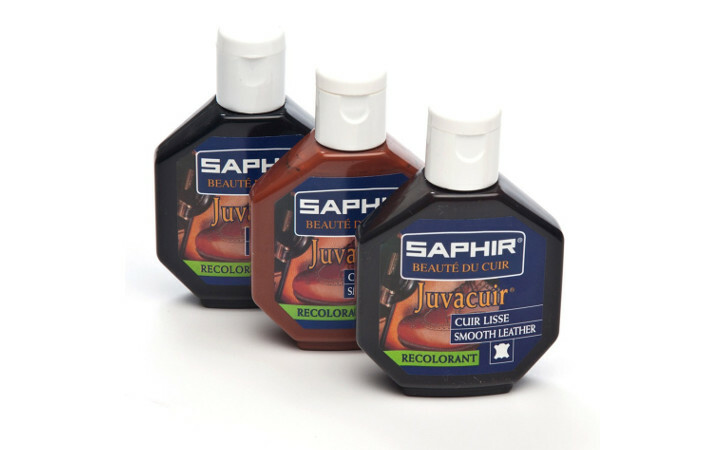 (Saphir shoe polishes do not contain any silicones or resins, which are harmful for leather). After fully removing prior finishes and silicone deposits, Saphir Shoe Polishes are able to deeply penetrate leather to deliver essential nutrients and nourishment. After using, it is important to apply several coats of polish in order to rebuild the protective wax finish. 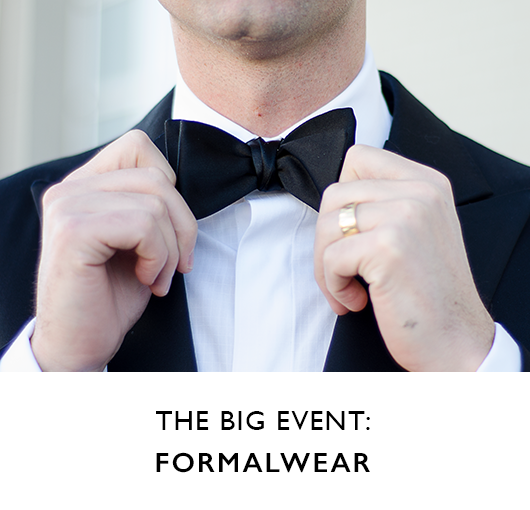 Apply using a cotton chamo is, rubbing in circular motions. Stop once the chamois is no longer taking any color or polish. Remove any residual Renomat with a slightly damp clean chamois. Saphir Reno'Mat is incredibly effective. Once prior polishes have been removed, it is important to rebuild the protective wax finish using first Saphir Renovateur (to restore nourishment) then several coats of Saphir Pommadier Cream Polish. It is not appropriate to use Reno'Mat every time your polish your shoes. Instead, reserve it for extensive cleanings one to three times a year. For more mild cleaning, use Saphir Cleaning Soap 200 ml. Reno'Mat can be used to remove dried polish from brushes and daubers. Saphir's Cleaning Soap is used to clean finished leather prior to polishing. This non-alkaline, solvent-free formula is gentle on finished leathers yet effective at removing polish buildup and dirt, restoring the leather to its natural look and opening pores for polishing. Used before the application of polishes or Saphir Renovateur, it opens the pores of the leather thus facilitating the penetration of pigments and delivery of nutrients. Wet a large dauber and work up a lather in the Cleaning Soap tin. Shampoo the shoe using the dauber in large, circular motions. Wash the dauber and repeat as necessary. When finished, wipe off any remaining Cleaning Soap using a damp cloth. Allow the shoe to dry for five to ten minutes before applying any polish. The Saphir Cleaning Regenerating Soap is a mild formulation and appropriate for use before normal polishing. For more aggressive cleaning, use Saphir Reno'Mat. 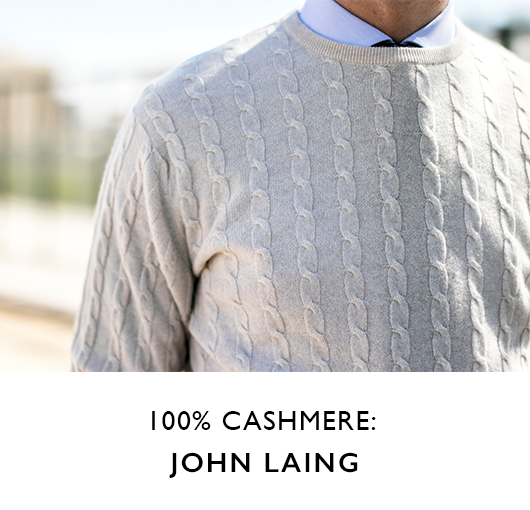 It is appropriate for any fine leathers -- from bespoke shoes to luggage and sofas. The Saphir Cleaning Regenerating Soap contains nutrients that help prevent the leather from drying after use. However, it is always appropriate to follow its use with Saphir Renovateur Medaille d'Or (for shoes) or Saphir Leather Lotion Medaille d'Or (for larger leather goods). For cleaning large leather goods, use a natural sponge instead of a dauber or brush. Saphir's Edge Dressing & Renovating Repair Cream is a resin-based recoloring cream used to repair deep scuff marks, scratches, and cigarette burns on smooth leather. It contains only resin and concentrated pigment and is very easy to control. Because of the resin base, it is very effective when used as edge dressing because it cannot be spilled (like traditional liquid dyes), is easily applied with one's finger, and will not bleed onto or stain clothing. As a Renovating Repair Cream, it can be used to repair deep scuff marks and damage to leather that traditional polishes would otherwise be unable to cover. Clean the area where you intend to apply. Apply using your finger to small areas at a time. Allow to dry for three to five minutes. Colors can be mixed to achieve any desired shade. Can be removed with Saphir Reno'Mat. Not a substitute for Saphir Cream Polish. Intended for use over small areas. Dilute with Saphir Renovateur if applied on an area larger than an eraser head. 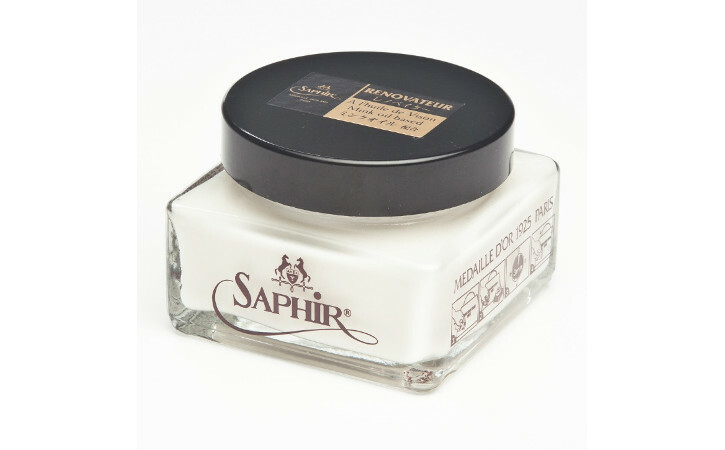 Saphir Creme Cordovan Medaille d'Or Cream Polish is specifically formulated to maintain and protect the tight pore structure unique to cordovan leathers. 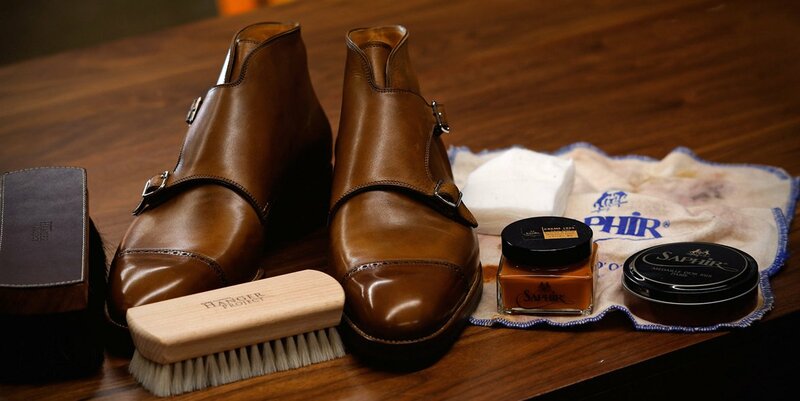 Instead of a turpentine-based solvent, which can expand the pores of the leather, it uses Neatsfoot Oil to penetrate the leather and deliver nutrients while containing more than seven varieties of wax. The colors can be mixed to produce a wide variety of finishes. If your shoes are particularly dirty or full of wax, silicone, or resin deposits, it is important to first clean and unclog the leather pores with the help of Saphir Reno'Mat. This is especially important before using Saphir Medaille d'Or for the first time, as silicone and resin deposits from ordinary polishes seal the leather pores and will prevent Saphir from penetrating the surface. Otherwise, first clean with Saphir Cleaning Soap to remove any dirt. Use Saphir Renovateur Medaille d'Or as a base coat to fully nourish and moisturize the leather then follow-up with Saphir Creme Cordovan polish. Colors can be mixed to achieve desired patina. Saphir Reptan Special Reptile Beauty Milk is specially formulated to provide essential nourishment and protection for exotic skins, including lizard, crocodile, and snake. Normal creams and polishes are not appropriate for these fine skins. Remove dust and dirt from shoes using a horsehair brush. The scales of these leathers easily accumulate dust; therefore it is essential to take it off before nourishing the leather. If the leather is very dirty, in particular around the joints of the scales, use the Saphir Cleaning Soap. It's solvent-free formulation will not damage the leather. Generously massage the Saphir Reptan Polish into the leather with a chamois using circular motions. If you are going to store the shoes, leave the Reptan on the leather and then later buff off before wearing. If you are going to wear the shoes immediately, buff off using a horsehair brush. Saphir Reptan Beauty Milk can be used on all exotic skins and is appropriate for both exotic shoes and leather accessories. Because exotic skins accumulate dust easily, first brush with a horsehair brush or clean using the Saphir Cleaning Soap. 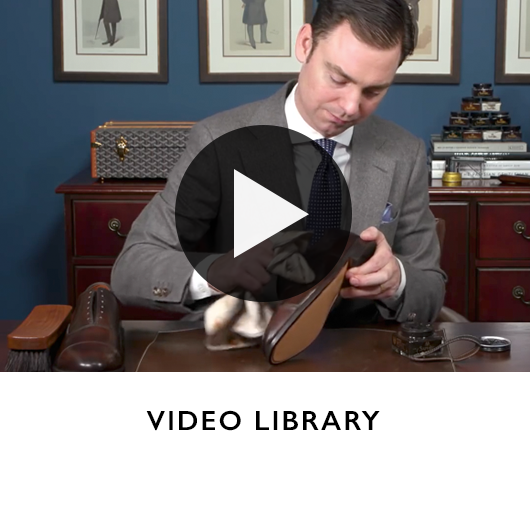 If you are going to store your exotic shoes for extended periords, leave a light coat of Reptan on the leather and store in a box in a cool, dark place. 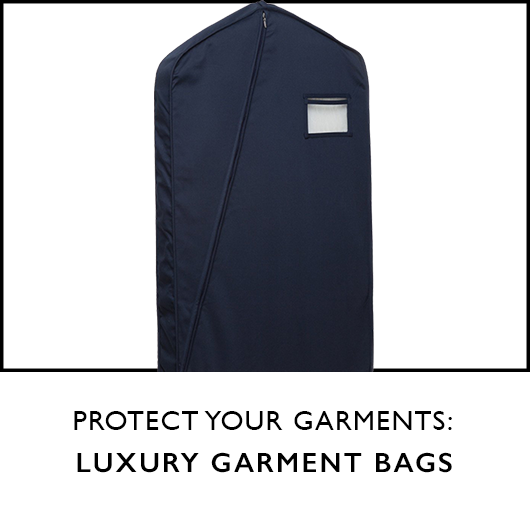 This will help protect the skin against drying during storage. When you are ready to wear the shoes again, buff off using a horsehair brush. 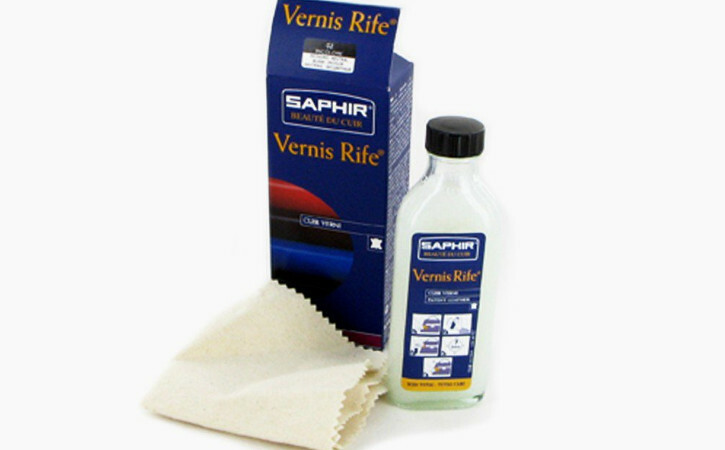 Saphir Vernis Rife is specially formulated to shine patent leather shoes and accessories. Available in neutral and black, it helps repair surface scuff marks, remove fingerprints, and restores a high-gloss shine particular to patent leather. Vernis Rife Patent Leather Cleaner can be used on both shoes and leather accessories. Allow the polish to completely dry before buffing off. 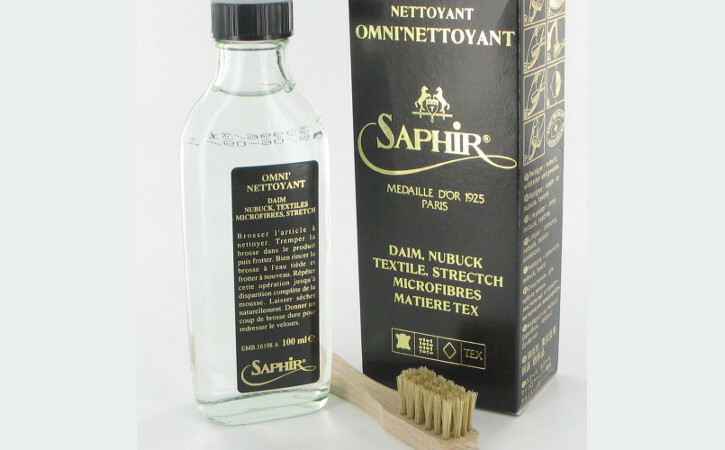 Saphir Omni"Nettoyant is a solvent-based cleaner for suede, nubuck, and textiles. This suede shampoo is very effective at removing embedded dirt and restoring the finish of suede, nubuck, and textile shoes. 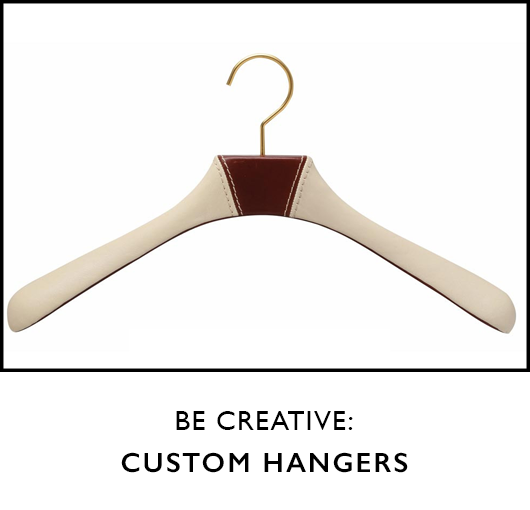 It can also be used effectively with larger suede accessories. The solvents in the Omni'Nettoyant are very effective at renewing the finish of suede in addition to cleaning. 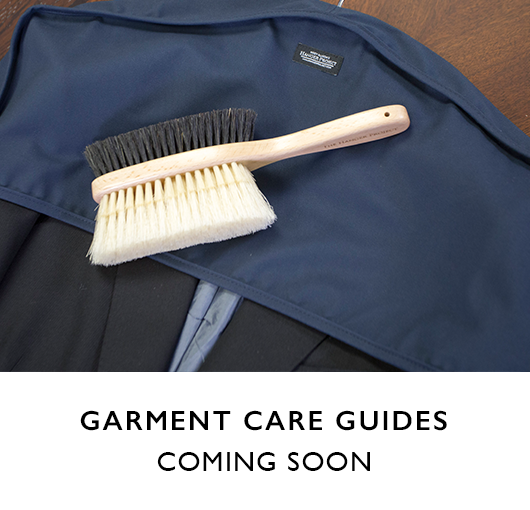 The Omni can be used to clean textile shoes, such as cashmere, wool, or linen slippers. 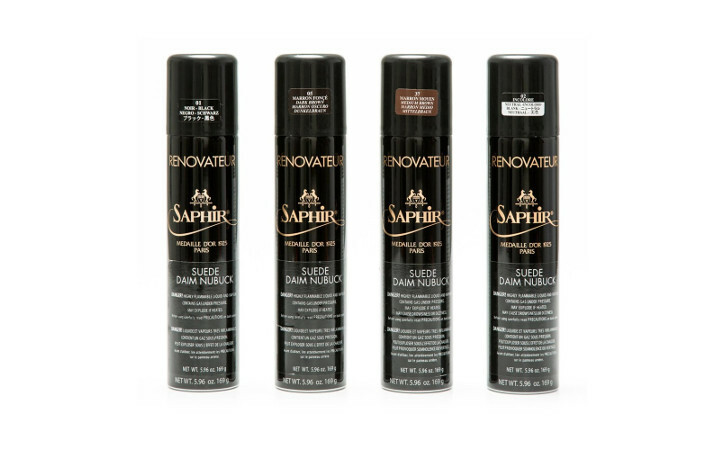 If the color has faded, use Saphir Renovateur Suede & Nubuck Spray to renew the color and luster of the finish. Use Saphir Super Invulner Waterproofing Spray for waterproofing and protection. 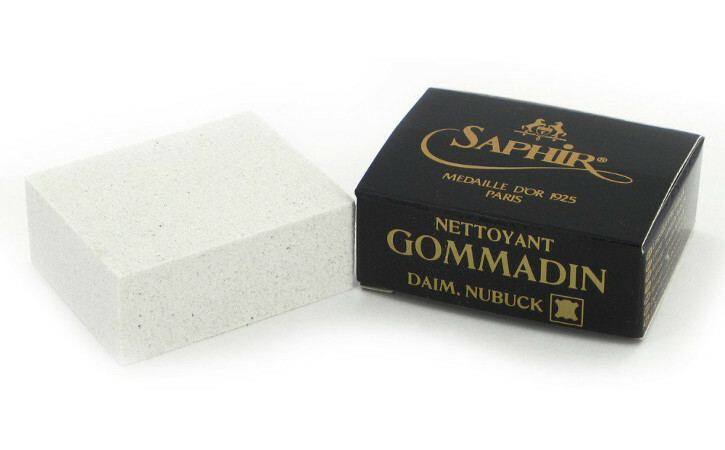 The Saphir Gommadin Suede Eraser removes stains, water marks and compacted soiling from suede and nubuck to restore your shoes' original finish and texture. The coarse texture of the Gommadin Eraser abrades stains and shine marks from the shoes while allowing it to crumble during use. The Gommadin Suede Eraser will not change the color of your shoes. The Gommadin Suede Eraser is meant for spot treatment whereas a Suede Brush is used for daily maintenance. If the Gommadin is unable to fully remove the stain, use Saphir Omni'Nettoyant Suede Shampoo to fully clean. 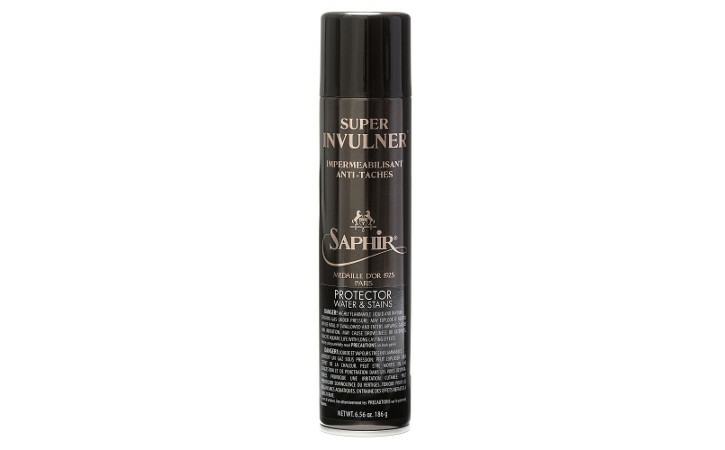 Saphir's Super Invulner Spray is used for protecting, waterproofing, and providing an anti-stain treatment for all leathers, suede, nubuck and textile items. Unlike other waterproofing products, Super Invulner does not contain silicone. It's like "Scotchguard" but uses a non-silicone formula safe for luxury leathers and textiles. The Super Invulner can be used to waterproof any material, including suede, smooth leather, and textiles. When water no longer beads, reapply. Saphir's MDO Renovateur Suede Spray cleans, recolors, and waterproofs suede and nubuck. It contains almond oil to enhance the silky appearance of suede, while protecting it against water stains. This product does not contain any silicone and is completely safe for the most expensive suede and nubuck shoes. Remove any surface dirt from the suede with a suede brush. Spray the surface of the shoe with a small amount from a distance of 12 inches. Allow to dry and brush with a suede brush. Saphir Renovateur Suede Spray is excellent at restoring the color saturation and luster of suede shoes. Do not use indoors. Although it does provide waterpoofing protection, we recommend using the Saphir Super Invulner afterwards for enhanced waterproofing protection. 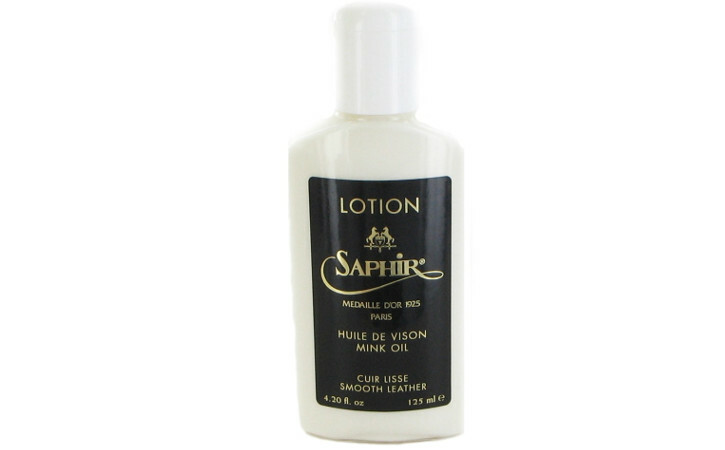 Saphir's Leather Lotion is a beeswax-based cream polish enriched with ultra-nourishing mink oil. Essentially a lighter version of Renovateur, it cleans, nourishes, protects and yields a matte shine for all leather goods, including smooth leather, alligator, and crocodile. It is excellent for larger leather goods, furniture, car interiors, etc. Used by conservators at the French National Library in Paris to nourish leather book covers. 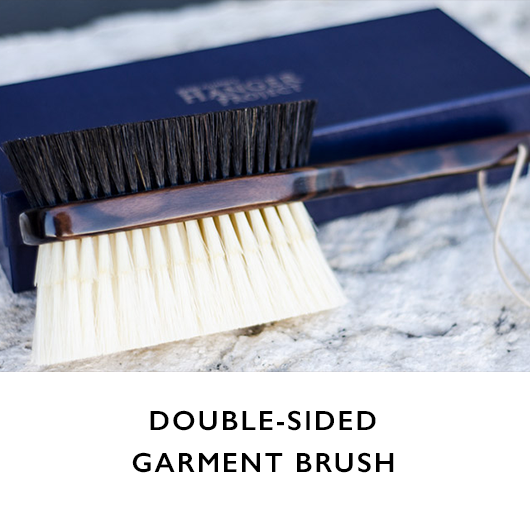 Remove any surface dirt with a horsehair brush. Apply a small amount of lotion with a cotton chamois, massaging the lotion into the leather. No buffing is required unless a higher-gloss sheen is desired. Appropriate for all leather goods. Nourishes and protects, which prevents leather from drying and cracking. If the leather is particularly dirty, first clean using the Saphir Cleaning Soap. Saphir's Juvacuir Recoloring Cream is an all-purpose repigmenting cream for use recoloring smooth leather in the same color. 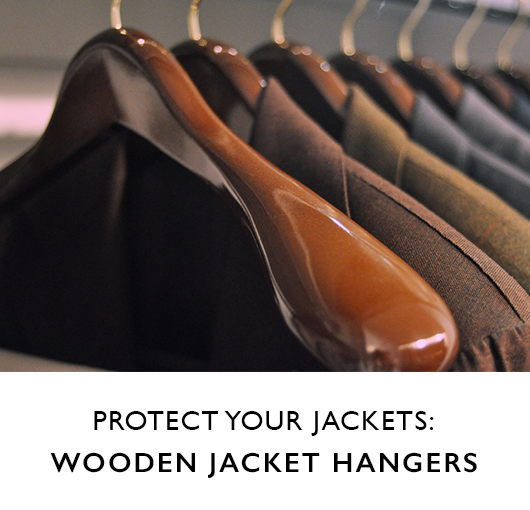 It can be used to recolor all smooth leathers (jackets, briefcases, wallets, shoes, furniture, luggage, saddlery) and will not rub off or water down. Uses Neats Footoil, instead of beeswax, to nourish the leather, which will not leave a white residue on clothing. Apply a small amount of Juvacuir with a cotton chamois, massaging the lotion into the leather. Buff with a cotton chamois or horsehair brush or dauber. The Juvacuir is not intended for everyday care -- only for occasional recoloring. Multiple colors can be mixed together to obtain any shade. Can be removed by using Saphir Reno'Mat Cleaner. 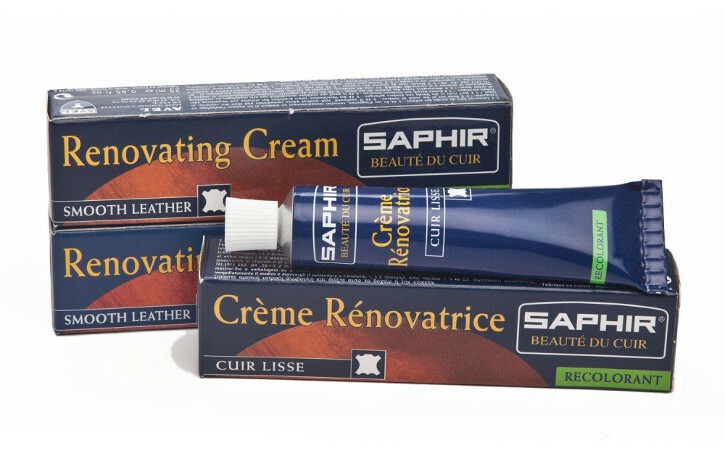 Use Saphir Leather Lotion afterwards to nourish leather. 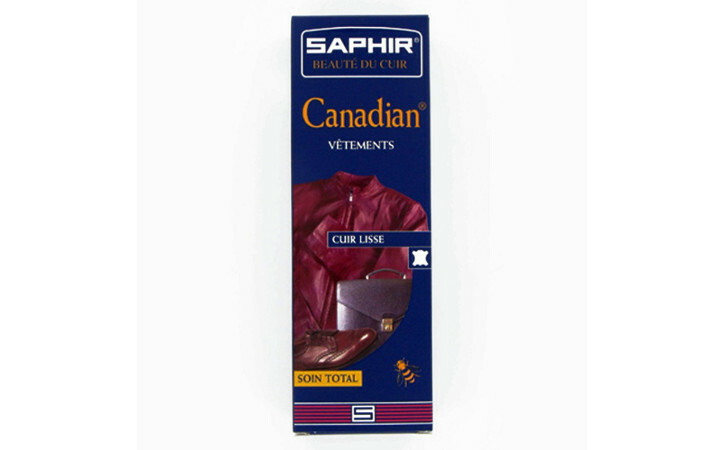 Saphir's Canadian is a restorative cream containing beeswax. It is formulated to clean, recolor, soften, nourish and waterproof leather goods without rubbing off onto clothing. It is intended for smooth leather articles, such as briefcases, luggage, leather jackets, and wallets. It is highly-concentrated and meant to be used sparingly. It is richer in waxes than the Renovateur, making it appropriate for thicker and more discolored leather. Remove any suface dirt with a horsehair brush. Apply a small amout of Canadian with a cotton chamois, massaging the lotion into the leather. Buff immediately after application with a cotton chamois or horsehair brush.